We are having some problems with the Blackboard VLE, so sets of lecture slides can now be downloaded from this website. Please go to the relevant lectures (below) and then click the download link. I normally update these slide sets with additional recently published material shortly before each lecture is delivered. This course will focus on the biochemical processes that convert information from the internal and external environments into hormonal or neuronal signals. In addition to the intracellular signal transduction pathways, the course will include transducer evolution, organogenesis, dynamic range, adaptation to ongoing stimuli, and selective filtering of irrelevant information by the transducing cells. Sensors will be considered in relation to their downstream processing systems and the biological effectiveness of the overall feedback loop. Much of the literature is concerned with mammals, but relevant examples from invertebrates, plants and bacteria will be included where appropriate. Sensory impairment is a significant human problem that affects a large proportion of the population at some stage in their lives. Technological advances and better understanding of the underlying mechanisms can help with this. Consider especially the plight of those with a double sensory impairment, such as the patient who provided this account. There is a local Leeds charity operating from Shire View in Headingley that tries to assist such people in Leeds. Physiology texts tend to focus on the downstream processing within the central nervous system, but our course concentrates on the initial transducers and their immediate neighbours. How much work should I do? This is an open-ended course so it is important to know when to stop. The University recommends about 150 hours study for a 20 credit module such as this. This topic is 16% of the course, which corresponds to 24 hours in total, or about 3 hours private study for each 1 hour lecture. Most of this time will be spent reading original papers and reviews. Don't get bogged down in detail, and don't try to memorise enormous lists of genes or protein folding motifs. It is sufficient to know that there are lots of them! I am revising the references on this website. Over the years we have accumulated far too many, and some of the older ones are out of date. I am aiming for a much simpler system in the future with many fewer papers, but for the time being you will find both the old and the new systems in use. In the lecture summaries, some of the papers are highlighted in red. These are either important seminal papers or they have particularly good diagrams or explanations. You should concentrate on these. For each sensor, try to understand how it works, and how it adapts to gradual changes in the input signal. Focus on the diagrams and summaries in the papers, not on the "materials & methods". It is better to know a little about lots of sensors rather than enormous detail about one or two, but there is no need to cover every one. Examinations: What do you need to know? This is a rapidly expanding field, where new papers are being published faster than your lecturer can read them. In these circumstances we will not set nit-picking examination questions that focus on a single tiny aspect, or rely on reading one particular paper, or knowing one particular experimental technique. Expect "broad brush" questions where you can select the aspects that you want to cover, and where there will be opportunities to compare different species and different sensory modalities. It won't matter if you have forgotten some of this course, but don't expect to waffle through if you have forgotten ALL of it! Exam question 2005: "Discuss with examples the biochemical mechanisms responsible for sensory adaptation." Download the 2005 marking scheme. Exam question 2006: "Discuss the roles of motor proteins in sensory transduction and adaptation." Download the 2006 marking scheme. Exam question 2007: "Discuss the roles of primary cilia in sensory transduction." Download the 2007 marking scheme. Exam question 2008: "Discuss the biological importance of sensory adaptation and outline the adaptation mechanisms in a variety of biological transducers." Download the 2008 marking scheme. Exam question 2009: "Describe with examples how the basic molecular architecture of primary cilia and microvilli has been adapted to create a wide range of sensory transducers." Download the 2009 marking scheme. Exam question 2010: "Compare and contrast the signal transduction mechanisms in sense organs that monitor the external world with those that monitor the internal condition of the body. Please illustrate your answer with some specific examples." Download the 2010 marking scheme. The exam question in 2011 will follow a generally similar pattern to those set in previous years. When revising, make sure that you cover a good spread of topics, although we do not expect you to remember every last detail about all of them. Sensory transducers report biologically relevant information to their owners. Monitoring systems for oxygen, carbon dioxide, glucose, small molecules and ions, temperature, osmolarity and fluid flow have limited dynamic range and respond more slowly to stimulation. Students should also be prepared to put the transduction pathways in a biological context: how did these systems evolve, how are they constructed during organogenesis, and how are they related to the overall biological fitness of the organism? There is an excellent open access review by Stephan Frings (2009) Primary processes in sensory cells: current advances. J Comp Physiol A 195, 1�19. Sensory adaptation. Biological significance of changes in signals rather than static levels. Importance of negative feedback and integration in achieving a wide dynamic range. Methyl-accepting bacterial chemotaxis proteins as a prokaryotic example. Vertebrate TRP receptors for heat and cold. Depolarisation. Cross reactivity with capsaicin and menthol. Certain fundamental features are common to all closed-loop control systems, which are illustrated below. Every closed loop system keeps a controlled variable C as close as possible to some reference value R despite interference by an external load L which disturbs the result. In order to achieve its objective the control system subtracts C from R so as to generate an error signal, E. This error signal regulates the flow of material or energy M into the controlled system so as to minimise E and compensate for the effects of the external load. Every closed loop system needs a reference value which provides a target to aim for. This is true even for biological control systems, although sometimes the targets are obscure. There is no requirement for the target to stay constant, although they often do. Biological reference values may be genetically determined, for example through the amino acid sequences of regulatory proteins, which define their binding constants for allosteric effectors. Behavioural targets for an organism might also reflect the genetically programmed "wiring diagram" for the central nervous system. For sensory transducers the reference value is very definitely NOT constant, because it is the input signal from the outside world. The transducer will commonly track this varying input signal, and thereby generate first derivative and filtered information more appropriate to the needs of the organism. The key concept is that bacteria are too small to sense chemical gradients directly (they would detect the same concentration back and front) so the only way that they can discover the best direction of travel is to make small random movements in arbitrary directions, and to keep going for longer if things are are getting better. E. coli cells have typically half a dozen flagellae, distributed over the surface of the cell. Each flagellum can be independently rotated by a motor in the cell wall, and is attached to the cell by an extremely flexible universal joint. The flagellae are "handed" like corkscrews. If they all rotate anti-clockwise (viewed from the far end) then they can mesh together and form an efficient propulsive unit, but if one or more adopt a clockwise rotation the whole bundle flies apart and the cell tumbles randomly in the growth medium. The "classical" chemosensory system is based on periplasmic ligand binding proteins which interact with methyl-accepting chemotaxis proteins (MCPs) plugged through the bacterial inner membrane. If the attractant concentration falls, the MCPs induce autophosphorylation of CheA, which in turn leads to phosphorylation of CheY and CheB. CheY switches the drive motor to clockwise mode (favouring tumbling) and CheB strips methyl groups from the MCPs, increasing their sensitivity to attractant ligands. The effect is that the degree of MCP methylation tracks the attractant concentration, but after a short delay. This allows each cell to "calculate" the first derivative of the attractant concentration, and modify its behaviour appropriately. The negative feedback methylation system greatly increases the dynamic range of the receptor proteins, and also selectively amplifies the vital first derivative information that bacteria need for survival. Despite their relative simplicity, bacterial chemosensors are typical "external facing" sensors. They are fast, sensitive (protein kinase amplifier) and highly selective (partly through the use of periplasmic binding proteins), they adapt to ongoing stimuli (through methylation), they report changes not the steady state, and they have an "on/off" digital output: tumble or swim. Similar selection presures may generate similar adaptations throughout the living world. Traps for the unwary: Bacteria are full of variety, and collectively respond to a vast range of compounds. Some swim towards oxygen, some swim away from it. In addition to the periplasmic binding proteins, there are inputs from the phosphotransferase system responsible for sugar uptake, and from cytosolic receptors as well as those in the periplasmic space. Parts of the signalling system are the opposite way round in Gram-negative E. coli and Gram-positive B. subtilis however the overall response is similar. There are other types of bacterial motility in addition to rotating flagellae. Some of this is better covered in the review by Szurmant & Ordal (2004) which has a very helpful table of protein components. This is based on the article by Wadhams & Armitage (2004) Nature Reviews Molecular Cell Biology 5, 1024-1037. This somewhat prolix example is a little repetitious and intended for formative use. Eukaryotic sensory pathways commonly rely on serine, threonine or tyrosine protein kinases, whereas prokaryotes often use histidine�aspartate phosphorelay (HAP) systems. HAP systems have at least two components � a dimeric histidine protein kinase (HPK) and one or more response regulators (RR). CheA is a dimeric HPK that interacts with transmembrane receptors. The kinase domain of one monomer phosphorylates a (1) arginine aspartate cysteine glutamate histidine lysine serine threonine tyrosine residue in the other. The phosphoryl group is then transferred to a conserved (2) arginine aspartate cysteine glutamate histidine lysine serine threonine tyrosine residue of the relevant RR, activating the output domain of the RR. Two response regulators CheY and CheB compete for binding to CheA. E. coli move by rotating five to eight helical flagella anticlockwise, causing them to wrap together into a bundle that propels the cell forwards. Temporarily rotating some flagellae clockwise disrupts this bundle, causing the cell to tumble. When the motors resume anticlockwise rotation, the cell has reorientated and swims off in a new direction. In homogeneous environments, bacteria (3) remain stationary tumble ca. 10 times per second tumble ca. once per second tumble ca. once per ten seconds tumble ca. once per minute cease tumbling producing random motion. In non-homogeneous environments, variations in the intervals between tumbling bias the overall motion towards regions containing higher attractant concentrations, or lower concentrations of toxic chemicals. Bacteria are too (4) permeable impermeable mobile slow symmetric irregular large small round long to sense a spatial concentration gradient along their length and therefore use temporal sensing to monitor the concentration at more widely separated points. E. coli can detect transient changes in ligand concentration despite long-term variations in background concentration spanning five orders of magnitude. Chemotactic signals are detected by four dedicated transmembrane chemoreceptors: Tsr, Tar, Trg and Tap. These methyl-accepting chemotaxis proteins (MCPs) protrude through the inner membrane into the periplasmic space. MCPs bind some ligands directly, but respond to others with the assistance of periplasmic binding proteins. An adaptor protein, (5) CheA CheB CheB-P CheR CheW CheY CheY-P CheZ MCP PBP helps to link the MCPs to the cytoplasmic HPK, CheA. A continuously active methyltransferase enzyme (6) CheA CheB CheB-P CheR CheW CheY CheY-P CheZ MCP PBP preferentially methylates those MCPs which have bound attractants, but ignores those which have bound repellants. (7) CheA CheB CheB-P CheR CheW CheY CheY-P CheZ MCP PBP removes these methyl groups. This ultimately causes the average methylation level to track the net attractant / repellant balance, after a slight delay. Decreased concentrations of attractants result in decreased occupancy of MCPs, which stimulates CheA trans-autophosphorylation. This increases the concentration of (8) CheA CheB CheB-P CheR CheW CheY CheY-P CheZ MCP PBP which binds to the flagellar motor, causing a switch to clockwise rotation. This results in cell tumbling and direction change. A phosphatase (9) CheA CheB CheB-P CheR CheW CheY CheY-P CheZ MCP PBP terminates this process. CheB is also phosphorylated by (10) CheA CheB CheB-P CheR CheW CheY CheY-P CheZ MCP PBP and results in an increased methylesterase activity and demethylation of the MCPs. Demethylated MCPs have a reduced ability to induce CheA autophosphorylation (even in the presence of a low concentration of attractant) so the rate of CheA autophosphorylation and therefore the rate of direction changing returns to the pre-stimulus level. Adaptation is complete and the system is ready to sense further changes in ligand binding. Increased concentrations of attractant inhibit the autophosphorylation of CheA, which reduces the concentration of (11) CheA CheB CheB-P CheR CheW CheY CheY-P CheZ MCP PBP and therefore reduces the frequency of motor switching. This causes bacteria to swim for longer in the current desirable direction. CheB phosphorylation and methylesterase activity is also reduced, allowing (12) CheA CheB CheB-P CheR CheW CheY CheY-P CheZ MCP PBP to re-methylate the MCPs. Methylated MCPs stimulate CheA autophosphorylation, even in the continued presence of a chemoattractant, so CheA autophosphorylation returns to the pre-stimulus level and the bacterium to a normal frequency of direction changing. The MCP signalling domain contains two adaptation regions, each with four to six glutamate residues that can be reversibly methylated. Some of these glutamates are actually encoded as glutamines, which mimic methylated glutamates and probably ensure that newly translated MCPs are inserted into the membrane in a neutral signalling state. CheB is a dual-function enzyme, which can deamidate as well as demethylate MCPs. Deamidation of the glutamine residues to glutamates exposes new targets for methylation by CheR and, therefore, for adaptation. Click here to see the complete bacterial motility reference list. The primary cilium appears first after cell division, and the much more numerous motile cilia in ciliated epithelia are apparently derived from the primary cilium by multiplication of the basal body. For many years primary cilia were regarded as vestigial structures, until they were discovered to play key roles in sensory transduction. Animal cilia are sometimes called flagella, but this term is now deprecated because of potential confusion with bacterial flagella which have a completely different structure. Distinguish also between centrioles, centrosomes and centromeres! Many animal sensory transducers are derived from modified cilia. This is true for smell, vision, hearing and fluid flow. New functions are still being added to this list. With hindsight, it is hardly surprising that biosensors should be located on a cellular projection where they are better exposed to the environment. The primary cilium is increasingly referred to as the 'antenna' of the cell. There is a good open access review: Singla & Reiter (2006) The Primary Cilium as the Cell's Antenna: Signaling at a Sensory Organelle. Science 313(5787), 629 - 633. There are 10 - 30 olfactory cilia on each olfactory sensory neurone (OSN) and each cilium has a "9 + 2" axoneme with doublet microtubules in the short proximal segment near the basal body, rather than the "9 + 0" organisation in primary cilia. However, olfactory cilia are non-motile in most species, and have a long, thin distal segment containing 1 - 4 singlet microtubules. The distal segment carries most of the olfactory receptors. Unlike most nerve cells, OSNs have a relatively short life and are replenished from a stem cell population. The olfactory cilia are formed by repeated duplication of centrioles, followed by migration of the centrioles to the dendritic knob, where they are transformed into basal bodies. A single primary cilium appears first, before the remainder of the olfactory cilia are formed. Vertebrate photoreceptors are derived from single, hugely modified primary cilium. Each of the sensory hair cells in the mammalian inner ear bears a single "kinocilium". This is a primary cilium that organises the stereocilia (microvilli) where vertebrate auditory transduction takes place. Defects in ciliogenesis can therefore have catastrophic "pleiotropic" effects on sensory development, and severe disabilities can result affecting several sensory modes. Cilia form a distinct cellular compartment. Although there is no internal membrane bounding the base of each cilium, specialised proteins accumulate near the basal body and effectively close off the interior of the cilium from the remainder of the cell. Cilia grow by the addition of new subunits to the distal tip. Diffusion is difficult along these long, narrow organelles, and a specialised Intraflagellar Transport System (IFT) based on type 2 kinesins is used to specifically deliver particular proteins to the tip. A retrograde transport system based on cytoplasmic dynein returns damaged or surplus proteins to the base for recycling. There is a recent mini-review on IFT: Scholey & Anderson (2006) Intraflagellar transport and Cilium-Based Signaling. Cell 125, 439-442. There is collection of 13 essays on cilia, edited by Yoder (2008) Ciliary Function in Mammalian Development which is volume 85 in the series Current Topics in Developmental Biology. This book is mostly about the molecular biology of cilia rather than the details of mammalian development, and is highly recommended. In mammals (but not, apparently, in arthropods) primary cilia are involved in both hedgehog and wnt signalling, and help to establish the orientation of cell division. This is crucial for the correct differentiation of complex 3-D structures, such as kidney tubules, bones & teeth, olfactory epithelia, retina and cochlea. H&E-stained medullary ray from human kidney, courtesy of Dr. Lutz Slomianka, Z�rich. Each human kidney contains about 1 million nephrons, illustrated in the cartoon below. Most of the water and solutes that are filtered in the glomerulus are resorbed in the proximal and distal convoluted tubules, and only a small proportion reaches the collecting duct. There is a large osmotic gradient from the outside of each kidney towards the middle. This gradient is produced by active sodium export from the tubule lumen to the interstitial space in the thick ascending limb of the loop of Henle, in conjunction with the passive water permeability of the descending limb and the counter-current fluid flows within the tubules and the capillaries. The osmotic gradient is exploited to concentrate the urine in the collecting ducts and to control its final osmolarity. Cell turnover healthy adult kidney is slow, but increases greatly following injury or disease. Progenitor cells may be derived from both kidney and bone marrow. Embryonic differentiation and subsequent repair both involve cell migration and both require urine flow. Human nephrons are typically about 3cm long, but only 20 µm internal diameter, and it is clear that the cells require some signals to correctly orient themselves in relation to their neighbours. Polycystins 1 and 2 are associated in the ciliary membrane. The function of polycystin-1 is only partly understood, but polycystin-2 is an ion channel that is also known as TRPP2. It belongs to the transient receptor potential (TRP) protein family [discussed below] whose numerous members contribute to a wide range of sensory transducers. Polycystin-2 is also indirectly linked to fibrocystin, through their mutual binding to the KIF3B motor subunit of kinesin-2. Primary cilia appear to sense fluid flow by passive bending, leading to Ca++ entry via polycystin-2. Similar fluid sensing (or mechano-sensing) mechanisms seem to operate in kidney tubules, liver bile ducts, pancreatic ducts, bones and teeth. Downstream signalling is thought to involve various routes. High internal Ca++ is associated with the retention of P100 and stat-6 within the cilia, and the movement of inversin to the cytosol, where it targets the Wnt pathway protein dishevelled for proteasomal degredation. Fibrocystin is cleaved in a calcium-dependent manner, and its C-terminal fragment moves into the nucleus. Lack of flow, and reduced Ca++ leads to proteolytic cleavage of polycystin-1 and the translocation of the polycystin tail, P100 and stat-6 to the nucleus, where they modulate transcription. Loss of cilial function through a wide variety of different mechanisms leads to inhibition of apoptosis, and the uncontrolled proliferation of kidney tubule cells. The orientation of cell division is incorrectly linked to tubule geometry, ultimately leading to the formation of cysts. This process may involve the serine / threonine kinase mTOR (mammalian target of rapamycin) which modulates ribosomal function and controls entry into the cell cycle. Preliminary results suggest that the immunosuppressant rapamycin, and the cyclin-dependent kinase inhibitor roscovitine may both be directly useful in the treatment of polycystic disease. Mutations affecting ciliogenesis have pleiotropic effects on sensory transduction. For example, Bardet-Biedl syndrome is primarily associated with polycystic kidney disease due to loss of tubular flow sensing, but among a host of other symptoms it may also be associated with loss of smell, retinal degeneration and deafness. At least twelve different genes may contribute to this disease, but all of them are involved in ciliogenesis and intraflagellar transport. Several homologues have been identified in C. elegans and Chlamydomonas which are also involved in ciliogenesis. It is possible to produce mutant Drosophila lacking centrioles and cilia, which (amazingly) complete a near-normal development although, lacking most sense organs, they die shortly after metamorphosis. Primary cilia are also believed to play a major role in shaping hard tissues such as bones and teeth. Please see the lecture slides for details of bone development and anatomical structure. Volume 291, issue 9 of the Anatomical Record has a series of papers detailing recent research on bone. 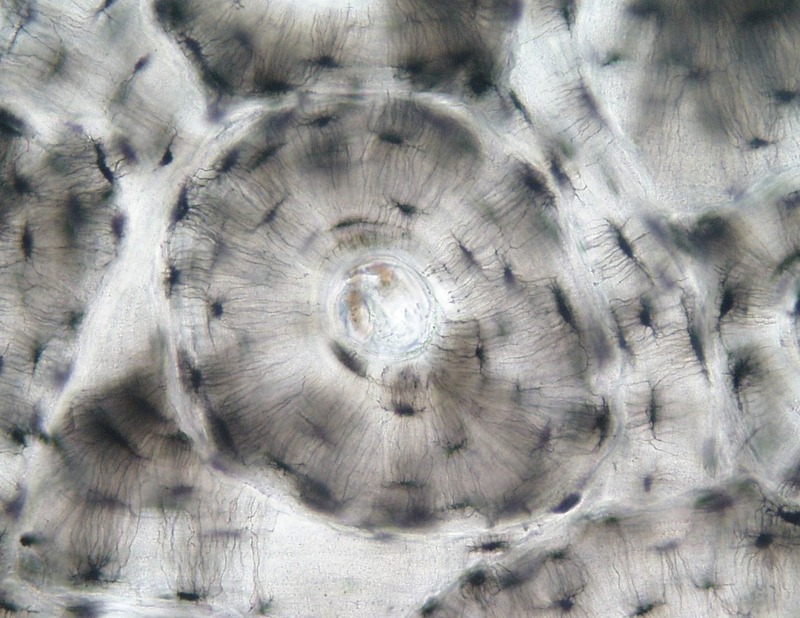 Unstained microscope image of compact bone, courtesy of Dr. Lutz Slomianka, Z�rich. This type of bone is found on the outside of the long bones. Note the Haversian canal in the centre of the image, which contains blood vessels. The black osteocytes are emebedded in lacunae which are connected by the canaliculae (thin black lines). Primary cilia have major sensory roles in bone and cartilage, where they are responsible for maintaining the shape and strength of the skeleton and connecting ligaments. Bone is subject to continuous remodelling throughout life, destruction and dissolution wrought by osteoclasts is compensated by continuous deposition of new bone by osteoblasts. Bone flexes under load, causing fluid to move through the internal canalicular network. This bends the primary cilia protruding into the canals, and initiates calcium-based signalling which ultimately maintains the correct shape and mineral density. Whitfield (2008) The solitary (primary) cilium � A mechanosensory toggle switch in bone and cartilage cells. Cellular Signalling 20(6), 1019-1024. The best academic website on classical bone histology is "Blue Histology" at the University of Western Australia with a mirror site at University College, Cork. Follow the links to bone dynamics and also to their large images section. Menezes & Onuchic (2006) Polycystic kidney disease (picture). Marshall & Nonaka (2006) Tuning in to the Cell's Antenna . Bandano et al (2006) Ciliopathies. Singla & Reiter (2006) The Primary Cilium as the Cell�s Antenna. Simons & Walz (2006) Polycystic kidney disease. Hu et al (2006) TRPP function. Giamarchi et al (2006) TRPP function. Click here to see the complete primary cilia reference list. Ionotropic signalling: The stimulus directly modifies an ion channel conductance in the receptor cell. Well known examples include nicotinic acetylcholine receptors, and hearing transduction. Ionotropic signalling is fastest because there are no intermediate stages, however there is less opportunity for modulation and filtering within the transducer itself. Metabotropic singalling: The stimulus generates some chemical intermediate which must be further metabolised in order to change an ion channel conductance within the receptor cell. Well known examples include catecholamine β receptors and visual transduction pathways, both of which involve various types of G-protein coupled receptors. Metabotropic signalling is generally slower than ionotropic signalling, but there is more opportunity for modulation and filtering within the transducing cell. Over 800 GPCRs have been identified in the human genome, and it is no surprise that several are involved in sensory transduction. GPCRs play major roles in taste, smell and vision. The classical signalling pathway involves a seven-transmembrane helix receptor linked via a heterotrimeric G-protein to a membrane-bound signaling enzyme, such as phospholipase C (taste, insect vision) , adenyl cyclase (smell) or phosphodiesterase (mammalian vision). GPCRs trigger potent signaling cascades, which are required for fast and effective responses to important physiological stimuli. It is, however, vital for all organisms to terminate these responses quickly, and to adapt to ongoing stimuli for maximum biological effectiveness. It is difficult to pass on one's genes while existing in a permanent state of alarm. A widely used mechanism is to phosphorylate the activated receptor using a variety of GPCR kinases (GRKs) after which an arrestin protein can bind and modify the signaling response. In addition to terminating the first response to a new stimulus, it is also possible to generate a different response to ongoing stimuli (such as receptor internalisation and down-regulation) that supersedes the initial reaction. GRK mechanisms are important for visual adaptation, and for smell, and these are discussed in greater detail below. There is a special section on GRKs and Arrestins in volume 69 of the Annual Review of Physiology (2007) which is highly recommended for an overview of this important field. This powerful technique allows measurements on a single ion channels embedded in a patch of membrane. It has been hugely informative and the inventors Erwin Neher and Bert Sakmann shared the Nobel prize in 1991. This is an important technique and all students should know about it, not just for this course. The best textbook account is in Boron & Boulpaep, but there is reasonable coverage in Stryer and also in Lodish. The essence of the technique is a small patch of excised membrane containing only one or two active ion channels stuck over the end of a micropipette. Depending on the experimental technique the patch may be either inside out or right way round, allowing ions and modulators to be applied to either side of the membrane. The recording equipment allows the experimeter to impose a fixed or time-varying potential across the membrane, while measuring the resulting current flow. This reveals the probability that the channel will be in the open state, and time course for some of the slower changes. It has been particularly informative to express the genes for ion channel proteins in Xenopus oocytes, whose plasmalemma normally contains very few channels. The newly synthesised proteins are correctly inserted into the cell membrane, where they can be studied in the absence of interfering activities. These were originally discovered in a Drosophila mutant that showed only a transient response to continuous illumination. They are among the most widely distributed receptor systems and numerous examples have been discovered in a wide range of species. Recent review: Venkatachalam & Montell (2007) TRP Channels. Ann. Rev. Biochemistry 76, 387-417. Huang (2004) an overview of the entire TRP superfamily! The Clapham lab website has tables summarising the properties of the major TRP channels. The best recent TRP review is Voets' article in Nature Chemical Biology, but in October 2005 [vol. 451(1)] there was a whole issue of Pflugers Archive (European Journal of Physiology) devoted to numerous aspects of TRP channels, which includes a contribution from Professor Beech. Click here to see the introductory TRP channel reference list. The key sensory channels are highlighted in red. Non-sensory channels are included for completeness. Download this table in printable form. 1. Olfactory sensory cilia are non-motile, but are not true primary cilia since there are several per cell. 2. The kinocilium is needed for correct hair cell assembly, but is not directly involved in transduction. Mucosal chemosensors (taste, gut wall sensors, smell). Anatomy, evolution and embryology of taste and smell. Taste buds. Transducers for sweet, bitter, salty, sour and umami. GPCRs and ion channels. Gustducin. Other chemoreceptors along the GI tract. Olfactory receptor neurones. 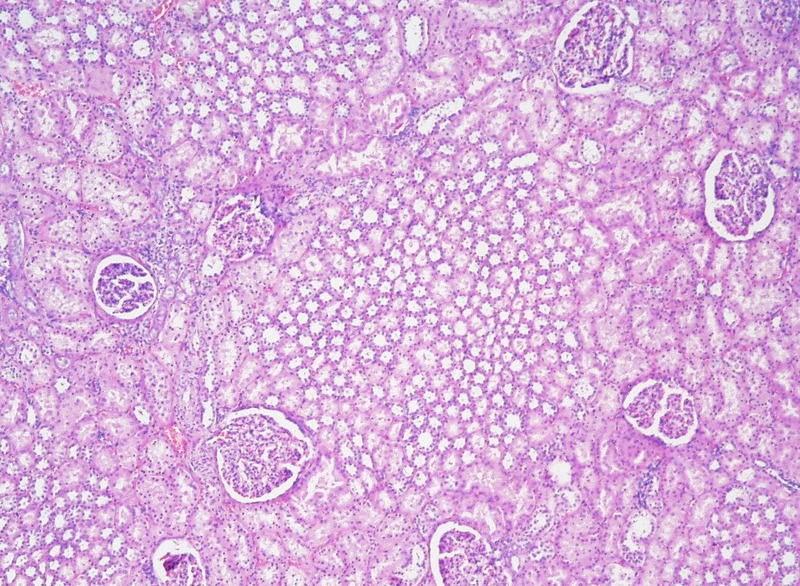 Glomeruli. Olfactory receptor families 1 and 2. Control of gene expression. Human / mouse comparisons. Vomeronasal organs. Sexual selection and MHC classes. Sperm chemoreceptors. 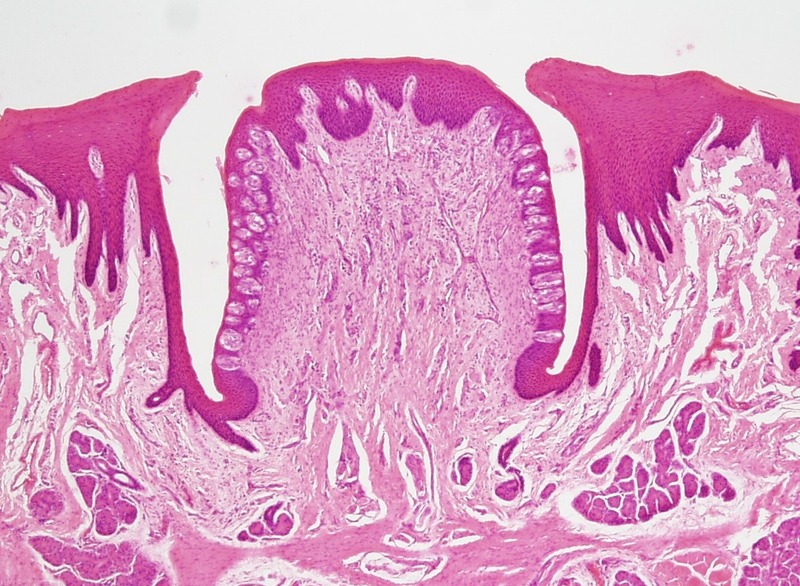 H&E stained circumvallate taste bud, courtesy of Dr. Lutz Slomianka, Z�rich. These are the largest taste organs, which form a readily visible line of pimples towards the back of the tougue. Hundreds of individual taste buds sample material in the deep cleft that surrounds each structure. Mature taste bud cells all have prominent microvilli. They are continuously renewed from a local population of stem cells and their half-life is about ten days. Type I "dark" cells are glial (supporting) cells, but also contribute to salty (chloride) tastes. The full salt flavour may also require sodium channels. Sub-populations of type II cells respond to sweet, bitter, umami (glutamate) and fats. They release ATP which stimulates purinergic receptors on type III cells and also on sensory neurones. Type III cells signal "sour" after intracellular acidification. Only type III cells make synaptic connections, where they release serotonin. The sensory nerves are "labelled lines" which always convey the same taste sensation, regardless of the source of the stimulation. Nerve "cross over" experiments have shown that stem cell differentiation into specific taste transducer cells is an inherent property of the epithelium, and is not controlled by the nerves. We do not know how the differentiating taste bud cells recognise their appropriate nerve connections, nor how their relative numbers are controlled. The same issues also arise with olfactory receptor cells, which are maintained in a similar manner. The fundamental sensing mechanism for sweet, bitter and umami involves different permutations of GPCR receptors linked through phospholipase C β2 which hydrolyses phosphatidyl inositol to yield IP3 and diacylglycerol. Fat sensing uses different receptors but connects to the same signalling system. The IP3 releases internal Ca++ stores which open TRPM5 channels, depolarising the cells and stimulating neurotransmitter and neuropeptide release. Neuroendocrine cells similar to taste buds are present throughout the GI tract, where they regulate the later stages of the digestive process as well as food intake through the mouth. Rozengurt & Sternini (2007) Taste receptor signaling in the mammalian gut. Current Opinion in Pharmacology 7(6), 557-562. Chandrashekar et al (2006) receptors and cells for mammalian taste. There is a group of excellent papers in Nature 16 November 2006. Hinterwirth et al (2004) cockroaches can calculate first derivatives! Traps for the unwary: like most other biological transducers, taste adapts to ongoing stimuli, as cooks have realised for thousands of years. Unfortunately, except for some limited work on sour taste receptors, we have little idea of how taste adaptation is achieved. Adaptation in olfactory sensory neurons certainly involves calcium ions, although other mechanisms may also be operational. Each olfactory sensory neuron expresses only one olfactory receptor (OR) on its sensory cilia. Mice and dogs have about 1000 functional ORs but most human ORs are pseudogenes. It is not yet clear how only one gene is selected per cell, or how each cell finds its matching glomerulus in the olfactory bulb. The same unique protein is expressed on the axonal process and somehow enables the axon to converge with other similar axons onto their common glomerulus in the olfactory bulb. These processes must be repeated throughout life, because olfactory receptor cells survive for only 2 weeks and are continuously renewed from a population of stem cells. Ofactory adaptation involves the negative feedback systems shown in the diagram above, and also may involve the temporary internalisation of receptors into a storage compartment. Olfactory transduction is a "many to many" process. Each olfactory receptor cell (ORC) expresses only 1 of 1000 possible receptor molecules. There are many similar cells in the olfactory epithelium, but all the ORCs that express the same receptor converge on one or two matching glomeruli within the olfactory bulb. We do not properly understand how they all find their correct target. The olfactory bulb is an extension of the brain that lies immediately behind the bony lining of the nasal cavity. Each ORC responds to a range of similar odorants, but responds to some much more strongly than others. Each odorant may trigger more than one type of ORC. Within the olfactory bulb there are inhibitory and excitatory pathways between the various glomeruli, which are homologous to similar pathways within the retina. In essence these circuits carry out contrast enhancement, so the overall pattern of signals from the glomeruli to the rest of the brain reflects the precise odour being sensed. Adapted from The synaptic organisation of the brain. G.M. Shepherd (OUP 2004) p35. This time derivative data is vital for following the trail. Insects require similar information to correctly follow a scent plume leading to their mate or their next meal. The physical position of each glomerulus within the mammalian olfactory bulb is inherited, tightly controlled and conserved across species, but there is no obvious pattern to it, and glomeruli that respond to very different stimuli may be immediately adjacent to one another. Kleene (2008) The Electrochemical Basis of Odor Transduction in Vertebrate Olfactory Cilia. Chemical Senses 33(9), 839-859. Imaia & Sakano (2008) Odorant receptor-mediated signaling in the mouse. Current Opinion in Neurobiology 18(3), 251-260. Song et al (2008) Olfactory CNG Channel Desensitization by Ca2+/CaM via the B1b Subunit Affects Response Termination but Not Sensitivity to Recurring Stimulation. Neuron 58(3), 374-386. Ma (2007) Encoding Olfactory Signals via Multiple Chemosensory Systems. Critical Reviews in Biochemistry and Molecular Biology 42(6), 463 - 480. Grosmaitre et al (2007) Dual functions of mammalian olfactory sensory neurons as odor detectors and mechanical sensors. Nature Neuroscience 10(3), 348-354. Mashukova et al (2006) β-Arrestin2-Mediated Internalization of Mammalian Odorant Receptors. J Neuroscience 26(39), 9902�9912. Brady et al (2006) Interplay between PIP3 and calmodulin regulation of olfactory cyclic nucleotide-gated channels. PNAS 103(42), 15635�15640. The vomeronasal organ is an accessory olfactory area that specialises in the detection of sexual smells and social status. Its function seems to be linked to the MHC system, with the result that many mammals prefer sexual partners that will optimise the immune capabilities of their offspring. It is disputed whether a similar system operates in humans. MHC proteins and a subset of ORs are also expressed in sperm, where they may participate in sperm chemotaxis, and ensure that eggs are more likely to be fertilised by an immunologically compatible sperm. Vision. Anatomy of the eye and brain, evolution and embryology. Histology and cell biology of the retinal photoreceptors and the retinal pigment epithelium. Vertebrate visual transduction pathway: rhodopsin, transducin, cGMP phosphodiesterase, cGMP-gated sodium channels, membrane potential. Time course for light adaptation. Rhodopsin kinase. Arrestin. Colour vision. Invertebrate light receptors, visual transduction and adaptation. Repair and maintenance of the visual equipment. Kinesins. Usher syndrome. Retinitis pigmentosa. rhodopsin - 7 transmembrane receptor containing 11-cis-retinal, isomerised to meta-rhodopsin II containing trans-retinal by light absorption. The X-ray structure is known at 2.8 Angstrom resolution. Click the link to display rhodopsin and ligands using Chime software. The best vision website is Webvision at the University of Utah, which has stunning graphics, time lapse photography, microscopy and animations. It is a shame that we do not have sufficient time to explore this resource in greater detail. The retina is a complex multi-layer structure which processes the raw photoreceptor output and principally reports changes in image contrast to the brain. See Field & Chichilnisky (2007) Information Processing in the Primate Retina: Circuitry and Coding. Annu. Rev. Neurosci. 30, 1�30. Fundamentally, the retina analyses the image for dark spots surrounded by light areas, and light spots surrounded by dark areas. If adjacent light and dark areas can be fused into lines these have potential survival value, and their orientation and location are reported to the brain. Large areas of constant colour and illumination have little biological significance and are largely ignored by the visual circuits. Most cells in the retina respond to illumination with graded changes in membrane potential, but the ganglion cells fire action potentials and their axons constitute the optic nerve. The photoreceptors are at the back of the retina, embedded in the retinal pigment epithelium, or RPE. The RPE is much more than a black anti-reflection coating, and plays a major role in photoreceptor physiology. In life, most images on the retina are in constant motion. Gaze moves rapidly in a series of saccades from one point of interest to the next, and in addition, the brainstem generates an occular microtremor at about 80Hz. This tremor has been used to estimate the depth of surgical anaesthesia and to diagnose brainstem death. Images that are artificially stabilised on the retina using an optical feedback system gradually fade away, and even under normal circumstances the changes associated with image movements are believed to assist visual processing: Rucci & Desbordes (2003) Contributions of fixational eye movements to the discrimination of briefly presented stimuli. Journal of Vision 3(11), 852-864. There are two classes of photoreceptors with a slightly different constructions. The rod cells are longer and provide monochromatic vision in dim light, in contrast to the fatter cones which come in red, green and blue flavours and provide colour vision in bright light. All photorecepors use rhodopsin and the colour specialisation arises from differences in the protein sequence. Photoreceptor cells survive throughout life, but the photosensitive discs in the outer segment are continually renewed. Kinesin-2 drags new disc materials along the short primary cilium to the base of the outer segment. Over the coure of the next month each disc gradually migrates outwards along the outer segment, until eventually it is shed from the tip and phagocytosed by the RPE. In mammals the RPE is also responsible for recycling trans-retinal back to cis-retinal and returning it to the photoreceptors. The active chromophore 11-cis-retinal is an aldehyde that forms a Schiff base with lysine 296 in opsin. Light absorption converts it to all trans retinal, which dissociates from the protein within seconds and is reduced within the receptor cell to all trans retinol, or vitamin A. The vitamin A is taken up by the RPE and esterified with palmitate taken from membrane phospholipids. An isomerohydrolase then converts the trans retinol to 11-cis-retinol, using the energy released by ester hydrolysis to drive the thermodynamically unfavourable isomerisation reaction. The 11-cis-retinol is oxidised to 11-cis-retinal within the RPE before it is returned to the photoreceptor cells and recombined with opsin. In the dark, there is a high internal concentration of cyclic-GMP in the rod outer segments. cGMP keeps a ligand-gated TRP channel open in the plasmalemma, leading to rapid entry of sodium ions which partially depolarises the cell [-30mV]. The synaptic body continuously secretes glutamate, which is an inhibitory neurotransmitter. Rhodopsin is a 7-transmembrane helix integral membrane protein plugged through the disc membranes. The retinal chromophore is buried deep in the lipid bilayer. Key interactions are all on the cytosolic side of the disc membrane. Photoexcited rhodopsin binds to a G-protein transducin, and exchanges GTP for GDP thereby activating transducin. This process is typically repeated several hundred times, hugely amplifying the original signal. The Tα subunits dissociate from the G-protein and activate a cyclic GMP phosphodiesterase associated with the disc membrane. The phosphodiesterase provides a second stage of signal amplification. The concentration of cyclic-GMP falls within a fraction of a second, closing the sodium channels. c-GMP binding is highly cooperative process, with a Hill coefficient of 3. The rod outer membrane hyperpolarises [-70mV], and the internal calcium concentration falls. The synaptic body stops secreting inhibitory neurotransmitter, thereby exciting bipolar cells within the retina. Tα subunits bound to phosphodiesterase hydrolyse GTP, thereby terminating their own activity. Rhodopsin kinase phosphorylates photoactivated rhodopsin on the cytosolic surface of the discs. Arrestin binds to phosporylated rhodopsin and blocks further transducin binding. The fall in calcium concentration stimulates rhodopsin kinase, via the protein recoverin, as part of the adaptation process. The fall in calcium concentration stimulates guanyl cyclase, restoring the cGMP concentration as part of the adaptation process. Transducin, arrestin and recoverin are moved between the rod inner and outer segments as part of the adaptation process. Visual adaptation has several components, which differ in speed and dynamic range. At the most basic level, photodissociation of activated rhodopsin bleaches the protein and renders it temporarily unavailable for further transduction events. Reactivation in mammals depends on retinal recycling within the RPE, which is relatively slow. The percentage of bleached rhodopsin in the photoreceptors rises as the light intensity increases, so there is less coloured rhodopsin available to absorb light. This leads to a fall in light sensitivity at high light intensities, and increases the dynamic range. In normal daylight, essentially all the highly sensitive rod photoreceptors are fully bleached, so the rods contribute relatively little to daytime vision. Adaptive movement of proteins along the primary cilium - modified from Calvert et al (2006). Compare and contrast visual transduction and adaptation in mammals and drosophila. Traps for the unwary: There is little doubt that the Drosophila visual transducers outperform the vertebrate system so far as light detection is concerned. Although both systems can detect single photons, insect detectors respond faster than rods and cones, have better signal to noise ratios and a greater dynamic range. Perhaps when assessing phototransducer performance we are looking at the wrong thing. Vertebrates excel in image analysis. What matters to most animals are changes or differences in colour and light intensity, which signal threats, opportunities and mates. Constant signals have little biological interest. The vertebrate retina identifies and magnifies these differences and filters the most relevant information before transmitting it to the brain. In achieving this objective, the ability of the photoreceptors to adapt to differing light intensities is paramount for success. Photoreceptors make a graded response to illumination. Rods and cones hyperpolarise when illuminated, and reduce their glutamate output. Bipolar cells also make graded responses, but may either depolarise or hyperpolarise depending on the local circuitry. Amacrine cells and horizontal cells compare and contrast signals from adjacent photoreceptors, looking for dots and edges, and it is only the ganglion cells that generate normal action potentials. There is a major issue about eye evolution. Ciliary and rhabdomeric eyes appear "out of nowhere" in the fossil record about 543 million years ago, across a wide range of species, but the molecular data and especially the role of Pax6 in eye development suggest a common origin pre-dating bilaterian animals many millions of years earlier. The December 2006 issue of Arthropod Structure & Development (volume 35, issue 4 "Origin and Evolution of Arthropod Visual Systems") is largely devoted to this fascinating problem, and includes some stunning electron micrographs. Hearing. Anatomy of the ear and auditory nerve, evolution and embryology. Cochlea compartments: endolymph and perilymph. Organ of Corti, tectorial membrane, inner and outer hair cells. Stereocilia. Transduction mechanism. Adaptation motor. Spiral ganglion, afferent and efferent nerves. Outer hair cell motility. Frequency-selective amplification, attenuation and phase locked loops. Usher syndrome. Study the gross anatomy of the ear in a text book. The best diagrams are in Tortora & Grabowski, but Kandel is also good. This isn't an anatomy course, but you must understand how the various parts fit to together to make sense of their function. Sound waves striking the external ear (pinna) are directed into the auditory canal, where they cause the eardrum to vibrate. These vibrations are transmitted through the air-filled middle ear via three small bones (malleus, incus and stapes) to the fluid-filled vestibule and cochlea which are part of the inner ear. Each cochlea is roughly the size of your little finger nail, and has a spiral structure like a snail shell. It is divided internally into three compartments by the basilar membrane and by Reisner's membrane. The scala vestibuli communicates directly with the vestibule, and is also connected to the scala tympani via a small hole, the helicotrema at the apex of the cochlea. The scala media does not connect with either of the other two compartments, but is continuous with the space inside the semi-circular canals. Perilymph is on the outside of the transducing equipment, in the scala vestibuli and the scala tympani. It has a high sodium content and is similar to cerebrospinal fluid. Endolymph is on the inside, in the scala media, and is in contact with the transducing hair cells (see below). Endolymph has a high potassium content (150mM) and is secreted by the stria vascularis. The scala media is 80 to 100mV positive with respect to the external perilymph. This endocochlear potential is essential for hearing transduction, and is generated by Kir4.1 potassium channels in the basal cells of the stria vascularis. The transducers are hair cells,each of which bears a bundle of actin-based stereocilia (microvilli) on its exposed surface. A single primary cilium (kinocilium) also forms part of each bundle. This cilium is required for bundle assembly, but apparently plays no direct role in sensory transduction. This intricate and elaborate system apparently evolved from a flow sensor in a pre-cambrian filter feeding animal about 600 million years ago. This evolved further to make balance and acceleration measurements in primitive fish, and subsequently to transduce sound vibrations that are scarcely larger than atomic dimensions. Bending of the stereocilia opens ion channels in the cell membrane and initiates the transduction process. In life the tectorial membrane is closely applied to the hair cell stereocilia, which tilt backwards and forwards as the membranes vibrate. The main detectors are the inner hair cells, which have a dense sensory innervation. Mechanically gated ion channels in the stereocilia open and close as the bundle rocks with each vibration. Until recently the vertebrate transduction channel was believed to be TRPA1 but this has been disproved by gene knockout experiments. The endocochlear potential drives potassium (and calcium) ions into the hair cells when the tip channels open, and allows these cells to track the precise waveform of the input signal in real time. Such speed is essential to accurately locate sound sources in a three-dimensional space. There is an ancient sound amplification system that relies on active movements by the stereocilia to compensate for viscous damping within the passive transduction equipment. [Hudspeth (2008) Making an Effort to Listen: Mechanical Amplification in the Ear. Neuron 59(4), 530-545.] Such strategies have been used in regenerative radio receivers for almost a century, but the auditory equivalent presumably evolved about 500 million years ago in Cambrian times, since it is found throughout the vertebrate lineage and there is a similar system, based on primary cilia rather than microvilli, in insect chordotonal organs. Drosophila chordotonal organs. Adapted from Bechstedt & Howard (2008) Hearing Mechanics: A Fly in Your Ear. Current Biology 18(18), R869-R870. See also Nadrowski et al (2008) Transducer-Based Force Generation Explains Active Process in Drosophila Hearing. Current Biology 18(18), 1365-1372. Mammalian cochlea can amplify extremely faint sounds, and this process requires active movement by the outer hair cells, which have very few sensory fibres but a largely motor innervation coming from the brain. These anatomical features are not present in lower vertebrates, which rely only on active stereocilia. Sound production by the stereocilia and / or the outer hair cells is readily detectable as otoacoustic emissions. It may become pathological, leading to some forms of tinnitus. Individual hair cells and the basilar membrane are tuned to respond to specific frequencies, and this is achieved in part by differential mRNA splicing. High frequencies are detected near the base of the cochlea, and lower notes towards the apex. There is a precise tonotopic mapping between the frequency selective regions of the cochlea, and the downstream processing within the hindbrain and the auditory cortex. These connections are made in the embryo before the auditory transduction mechanism has matured. It is now believed that a temporary supporting structure called K�lliker�s organ stimulates the immature hair cells via a purinergic pathway, causing them to fire in complex patterns that allow the corresponding neurones to make the correct connections. See Forsythe (2007) A fantasia on K�lliker�s organ Nature 450, 43-44. Amplification and detection by the cochlea is frequency-selective and adjustable, so that faint sounds can be analysed while ignoring much louder noises at neighbouring frequencies. The detection system preserves the phase and intensity of the original noise, allowing the source to be located in space. The detection system adapts to varying sound intensities. Adaptation requires motor proteins. At least two separate processes are involved with very different response speeds. Students are strongly urged to read this review, BUT it makes no mention of important motor proteins, such as prestin, or the cochlear amplifier. Fortunately, there is another review by Ashmore (2008) Cochlear Outer Hair Cell Motility Physiol Rev 88, 173-210 which deals with this aspect, so students should read both reviews to get the full picture. Prestin is a very unusual biological motor, that responds directly to membrane potential at very high speed. It seems to have evolved from an ion channel that has lost its channel functions. It does not require ATP hydolysis for motility and derives its energy directly from the transmembrane electric field. It is the biological equivalent to a piezo-electric transducer. The adaptation motor is the class 1 myosin, Myo1C, which has a very different cross-bridge cycle and calcium sensitivity to the "conventional" class 2 myosin found in voluntary muscle. See Adamek et al (2008) Calcium sensitivity of the cross-bridge cycle of Myo1c, the adaptation motor in the inner ear. PNAS 105(15), 5710�5715. Calcium detaches Myo1C from the actin filaments. In 'resting' hair cells, with a low internal calcium, Myo1C complexes creep outwards along the actin filaments in the sterocilia, tensioning the tip links until these are just on the point of opening the transduction channels, resulting in a slow inward calcium leak. The system then remains in dynamic equilibrium, with motor slipping exactly balancing the motor tug. Louder noises fully open the channel, and the greatly increased calcium concentration detaches the myosin from the actin and greatly increases the rate of slipping. The adaptation motor slides back down the actin, slackening the tip links until calcium entry is restored to the resting level. Several other myosins are involved in stereocilia assembly. [Manor & Kachar (2008) Dynamic length regulation of sensory cilia. Seminars in Cell & Developmental Biology 19, 502�510.] Hair cells are not renewed, and must be maintained throughout life. The graded lengths of individual stereocilia within the bundle are achieved by differential actin treadmilling, regulated by myosins Ia, Ic, IIIa, VI, VIIa and XVa. Loss of any of these "unconventional" myosin genes leads to non-syndromic deafness in animals and man. There is an absolutely stunning website written by Mammano & Nobili which explores the anatomy and physiology of the mammalian cochlea in amazing detail. It is difficult to speak too highly of this site, which is full of brilliant anatomical drawings, scanning EM pictures, confocal images, video recordings and suberb computer animations. It takes several hours to read, but it is excellent throughout. Mio et al (2008) The Motor Protein Prestin Is a Bullet-shaped Molecule with Inner Cavities. J Biol Chem 283(2), 1137�1145. Stauffer & Holt (2007) Sensory Transduction and Adaptation in Inner and Outer Hair Cells of the Mouse Auditory System J Neurophysiol 98, 3360-3369. Grant & Fuchs (2007) Auditory transduction in the mouse Pflugers Arch - Eur J Physiol 454, 793�804. The December 2006 issue of Journal of Physiology (volume 576, issue 1) has an excellent collection of papers on the cochlea. Adaptation is once again the key to biological success. The cochlea is a frequency-selective amplifier, similar to a graphic equaliser on a hifi outfit, except that there are thousands of independent controls, each of which can be adjusted in real time to amplify only those frequencies currently of interest to the organism and to ignore everything else. Mechanotransducers (touch, tendon organs, muscle spindles, blood pressure, osmotic pressure) and internal chemosensors (pH, carbon dioxide, oxygen). ENaC and TRP families. Internal sensors have smaller dynamic range, less adaptation than external sensors. Islet cells, hypothalamus, solitary tract, portal vein, carotid bodies. The TRPC1 channel confers stretch sensitivity on many cell types. Normal touch sensitivity requires members of the degenerin / epithelial sodium channel family (Deg/ENaC). Mutations in these genes cause neurodegeneration, hence the name. They mediate touch sensitivity in C. elegans (O'Hagan et al, 2004) and are widely distributed in mammals. These pH- and amiloride-sensitive channels have a variety of alternative names, including ASIC and BNAC. 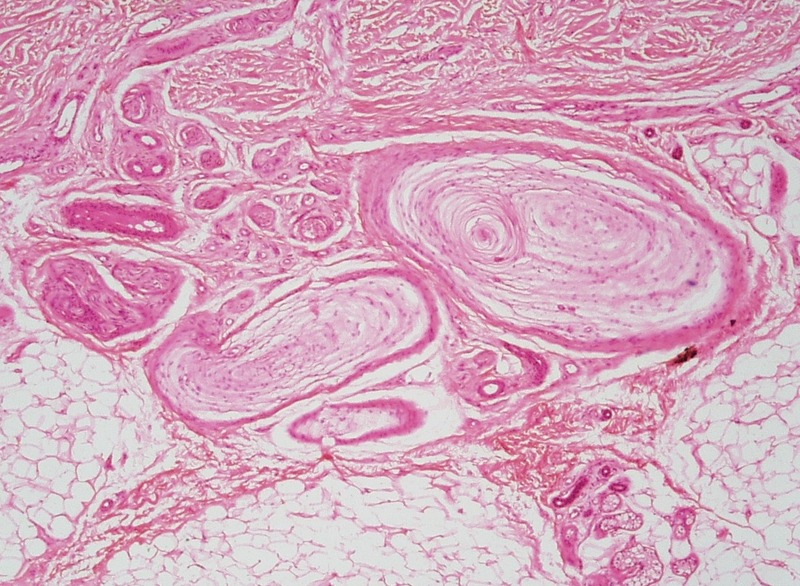 H&E-stained Pacinian corpuscles at the boundary between the dermis and hypodermis, courtesy of Dr. Lutz Slomianka, Z�rich. Golgi tendon organs measure tension, while muscle spindles signal rate of shortening as well as absolute length, but their receptors are not well characterised at a molecular level. Mechanical stretch has major effects on fibroblast and muscle growth, where uniaxial and multiaxial stretch have different receptor pathways (Hornberger et al, 2005). The high threshold mechanotransducer that responds to painful stimuli has not yet been identified (Hu et al, 2006) although there is no shortage of candidates. Mechanosensitivity is common, with many poorly characterised genes, so progress in this area has been relatively slow. Proteases are released during inflammation, and protease-activated receptors (Grant et al, 2006) sensitise TRPV4 and are thought to be responsible for the pain and increased mechanical sensitivity associated with inflammation. TRPV4 is also involved in the baroreceptors that help to regulate blood pressure, and (with TRPV2) in cerebral osmotic pressure sensing (Liedtke, 2006) and vasopressin release. Although it is essential for multicellular organisms, oxygen is an extremely reactive and potentially toxic gas. It oxidises sulphydryl groups and damages unsaturated lipids, generating free radicals which cause additional damage to proteins and nucleic acids. Regulatory mechanisms have evolved which keep tissue oxygen levels in the micromolar range, which is sufficient for mitochondrial respiration, while restricting non-enzymatic oxygen damage to sensitive molecules. Vertebrates have pre-capillary sphincters that regulate oxygen delivery to tissues. Similar systems are found in insect spiracles (Hetz & Bradley 2005, Burmester 2005) where oxygen is delivered in gaseous form. Oxygen sensing is important for the regulation of breathing and cardiac output. A major sensor in humans is located in carotid bodies, but inumerable minor sensors are responsible for the local regulation of blood flow. Note that vascular regulation in the lung diverts blood away from underventilated regions, which is the opposite way round to regulation in peripheral tissues, where blood is diverted towards areas of oxygen need. Reports (Kemp, 2005) that hemoxygenase-2 (HO-2) is the oxygen sensor, and the second messenger was carbon monoxide cause great excitment, which has recently been tempered by a report (Otega-Saenz et al, 2006)that oxygen sensing remains intact in HO-2 knockout mice. Many other systems have been proposed as cellular oxygen sensors, including succinate dehydrogenase and AMP-activated protein kinase (Evans, 2005). The September 2006 issue of Experimental Physiology (volume 91, issue 5) has a symposium on oxygen sensing. Abou Alaiwi et al (2009) Primary Cilia: Highly Sophisticated Biological Sensors. Sensors 9, 7003 � 7020. Adamek et al (2008) Calcium sensitivity of the cross-bridge cycle of Myo1c, the adaptation motor in the inner ear PNAS 105, 5710 � 5715. Baum & Kelliher (2009) Complementary Roles of the Main and Accessory Olfactory Systems in Mammalian Mate Recognition Annu. Rev. Physiol. 71, 141 � 160. Berbari (2009) The Primary Cilium as a Complex Signaling Center Current Biology 19, R526 � R535. Beurg et al (2009) Localization of inner hair cell mechanotransducer channels using high-speed calcium imaging Nature Neuroscience 12, 553 � 558. Bie (2009) Blood volume, blood pressure and total body sodium: internal signalling and output control Acta Physiol 195, 187 � 196. Birnbaumer (2009) The TRPC Class of Ion Channels: A Critical Review of Their Roles in Slow, Sustained Increases in Intracellular Ca2+ Concentrations Annu. Rev. Pharmacol. Toxicol. 49, 395 � 426. Bourque (2008) Central mechanisms of osmosensation and systemic osmoregulation Nature Reviews Neuroscience 9, 519 � 531. Chacon-Heszele & Chen (2009) Mouse models for dissecting vertebrate planar cell polarity signaling in the inner ear Brain Research 1277 , 130 � 140. Clement et al (2009) The primary cilium coordinates early cardiogenesis and hedgehog signaling in cardiomyocyte differentiation. J. Cell Sci. 122, 3070 � 3082. Dallos (2008) Cochlear amplification, outer hair cells and prestin Current Opinion In Neurobiology 18, 370 � 376. D'Angelo & Franco (2009) The dynamic cilium in human diseases PathoGenetics 2:3, . Erclik et al (2009) Eye evolution at high resolution: The neuron as a unit of homology Developmental Biology 332, 70 � 79. Evans et al (2009) The Route of Hypoxia-Response Coupling in the Carotid Body and Pulmonary Artery Ann. N.Y. Acad. Sci. 1177, 89 � 100. Fettiplace (2009) Defining features of the hair cell mechanoelectrical transducer channel Pflugers Archiv � European Journal of Physiology 458, 1115 � 1123. Furness et al (2008) The dimensions and structural attachments of tip links in mammalian cochlear hair cells and the effects of exposure to different levels of extracellular calcium Neuroscience 154, 10 � 21. Gillespie & Muller (2009) Mechanotransduction by Hair Cells: Models, Molecules, and Mechanisms Cell 139, 33 � 44. Gleason et al (2009) The transmembrane inner ear (Tmie) protein is essential for normal hearing and balance in the zebrafish PNAS 106, 21347 � 21352. Grillet et al (2009) Harmonin Mutations Cause Mechanotransduction Defects in Cochlear Hair Cells Neuron 62, 375 � 387. Harris & Torres (2009 ) Polycystic Kidney Disease Annu. Rev. Med. 60, 321 � 337. Hazelbauer et al (2008) Bacterial chemoreceptors: high-performance signaling in networked arrays TIBS 33, 9 � 19. Herness & Zhao (2009) The neuropeptides CCK and NPY and the changing view of cell-to-cell communication in the taste bud Physiology & Behavior 97, 581 � 591. Hock & Kralli (2009) Transcriptional Control of Mitochondrial Biogenesis and Function Annu. Rev. Physiol. 71, 177 � 203. Housley et al (2009) Purinergic signaling in special senses Trends In Neurosciences 32, 128 � 141. Hudspeth (2008) Making an effort to listen: Mechanical amplification in the ear Neuron 59, 530 � 545. Hwang et al (2008) Cilium evolution: Identification of a novel protein, nematocilin, in the mechanosensory cilium of Hydra nematocytes Molecular Biology and Evolution 25, 2009 � 2017. Insinna & Besharse (2008) Intraflagellar Transport and the Sensory Outer Segment of Vertebrate Photoreceptors Developmental Dynamics 237, 1982 � 1992. Jyotaki et al (2009) Multiple Umami Receptors and their Variants in Human and Mice J. Health Science 55, 674 � 681. Kato & Touhara (2009) Mammalian olfactory receptors: pharmacology, G protein coupling and desensitization Cell. Mol. Life Sci. 66, 3743 � 3753. Kaupp et al (2008) Mechanisms of Sperm Chemotaxis Annu. Rev. Physiol. 70, 93 � 117. Kelly & Chen (2009) Development of form and function in the mammalian cochlea Current Opinion In Neurobiology 19, 395 � 401. Kemp et al (2009) Enzyme-Linked Oxygen Sensing by Potassium Channels Ann. N.Y. Acad. Sci. 1177, 112 � 118. Khaliullina et al (2009) Patched regulates Smoothened trafficking using lipoprotein-derived lipids. Development 136, 4111 � 4121. Klasen et al (2010) Odorant-stimulated phosphoinositide signaling in mammalian olfactory receptor neurons Cellular Signalling 22, 150 � 157 . Kim et al (2009) Heteromeric TASK-1/TASK-3 is the major oxygen-sensitive background K+ channel in rat carotid body glomus cells J. Physiol. 587, 2963 � 2975. Knight et al (2009) Articular chondrocytes express connexin 43 hemichannels and P2 receptors-a putative mechanoreceptor complex involving the primary cilium? J. Anat. 214, 275 � 283. Kreneisz et al (2009) AMP-activated protein kinase inhibits TREK channels J. Physiol. 587, 5819 � 5830. Laakso et al (2008) Myosin I can act as a molecular force sensor Science 321, 133 � 136. Lamb (2009) Evolution of vertebrate retinal photoreception Phil Trans R Soc B 364, 2911 � 2924. Lehman et al (2009) An Essential Role for Dermal Primary Cilia in Hair Follicle Morphogenesis J. Invest. Dermatology 129, 438 � 448. Lelli et al (2009) Tonotopic Gradient in the Developmental Acquisition of Sensory Transduction in Outer Hair Cells of the Mouse Cochlea J Neurophysiology 101, 2961 � 2973. Lim & Park (2009) A mechanical model of the gating spring mechanism of stereocilia J Biomechanics 42, 2158 � 2164. Liu et al (2009) Grueneberg Ganglion Olfactory Subsystem Employs a cGMP Signaling Pathway. J. Comp. Neurology 516, 36 � 48. Martini et al (2009) Isolation and possible role of fast and slow potassium current components in hair cells dissociated from frog crista ampullaris Pflugers Archiv � European Journal of Physiology 457, 1327 � 1342. Mazelova et al (2009) Ciliary targeting motif VxPx directs assembly of a trafficking module through Arf4 The EMBO Journal 28, 183 � 192. Michalski et al (2009) Harmonin-b, an actin-binding scaffold protein, is involved in the adaptation of mechanoelectrical transduction by sensory hair cells Pflugers Archiv � European Journal of Physiology 459, 115 � 130. Munger et al (2009) Subsystem Organization of the Mammalian Sense of Smell Annu. Rev. Physiol. 71, 115 � 140. Muniz et al (2009) Evidence for Two Retinoid Cycles in the Cone-Dominated Chicken Eye Biochemistry 48, 6854 � 6863. Nadrowski et al (2008) Transducer-based force generation explains active process in Drosophila hearing Current Biology 18, 1365 � 1372. Nigg & Raff (2009) Centrioles, Centrosomes, and Cilia in Health and Disease Cell 139, 663 � 678. Park et al (2009) Identification of subdomains in NADPH oxidase-4 critical for the oxygen-dependent regulation of TASK-1 K_ channels Am J Physiol Cell Physiol 297: C855�C864, 297, C855 � C864. Praetorius & Leipziger (2009) Released nucleotides amplify the cilium-dependent, flow-induced [Ca2+]i response in MDCK cells Acta Physiol 197, 241 � 251. Raychowdhury et al (2009) Vasopressin receptor-mediated functional signaling pathway in primary cilia of renal epithelial cells Am J Physiol Renal Physiol 296, F87 � F97,. Roberts & Rutherford (2008) Linear and nonlinear processing in hair cells J Exp Biol 211, 1775 � 1780. Rodat-Despoix & Delmas (2009) Ciliar functions in the nephron Pflugers Arch � Eur J Physiol 458, 179 � 187. Santos-Sacchi et al (2009) Fast Electromechanical Amplification in the Lateral Membrane of the Outer Hair Cell Biophysical Journal 96, 739 � 747. Shah et al (2009) Motile Cilia of Human Airway Epithelia Are Chemosensory Science 325, 1131 � 1134. Shindo et al (2010) Lrmp/Jaw1 is Expressed in Sweet, Bitter, and Umami Receptor-Expressing Cells Chem. Senses 35, 171 � 177. Solomon & Lennie (2007) The machinery of colour vision Nature Reviews Neuroscience 8, 276 � 286. Sowa & Berry (2008) Bacterial flagellar motor Quarterly Reviews of Biophysics 41, 103 � 132. Spinelli & Gillespie (2009) Bottoms up: transduction channels at tip link bases Nature Neuroscience 12, 529 � 530. Stasiunas et al (2009) An adaptive model simulating the somatic motility and the active hair bundle motion of the OHC Computers In Biology And Medicine 39, 800 � 809. Stepanyan & Frolenkov (2009) Fast Adaptation and Ca2+ Sensitivity of the Mechanotransducer Require Myosin-XVa in Inner But Not Outer Cochlear Hair Cells J Neuroscience 29, 4023 � 4034. Sul & Iwasa (2009) Effectiveness of Hair Bundle Motility as the Cochlear Amplifier Biophysical Journal 97, 2653 � 2663. Temussi (2009) Sweet, bitter and umami receptors: a complex relationship TIBS 34, 296 � 302 . Torban & Goodyer (2009) The Kidney and Ear: Emerging Parallel Functions. Annu. Rev. Med. 60, 339 � 353. Touhara & Vosshall (2009 ) Sensing Odorants and Pheromones with Chemosensory Receptors Annu. Rev. Physiol. 71, 307 � 332.
van Netten et al (2009) Pairwise coupling of hair cell transducer channels links auditory sensitivity and dynamic range Pflugers Archiv � European Journal of Physiology 458, 273 � 281. Wang & Youle (2009) The Role of Mitochondria in Apoptosis. Annu. Rev. Genet. 43, 95 � 118. Wang et al (2009) Selective translocation of intracellular Smoothened to the primary cilium in response to Hedgehog pathway modulation. PNAS 106, 2623 � 2628. Wu et al (2009) Characterization of Primary Cilia in Human Airway Smooth Muscle Cells Chest 136, 561 � 570. Wyatt & Peers (2009) Hetero or homo, hypoxia has them all J. Physiol. 587, 2717 � 2718. Xu et al (2009) Rethinking How Hearing Happens Neuron 62, 305 � 307. Yarmolinsky et al (2009) Common Sense about Taste: From Mammals to Insects Cell 139, 234 � 244. Yin et al (2009) The Talpid3 gene (KIAA0586) encodes a centrosomal protein that is essential for primary cilia formation Development 136, 655 � 664. Zhao & Ross (2007) Mechanisms of Osteoclastic Secretion Ann NY Acad Sci 1116, 238 � 244. Zhou (2009) Polycystins and Primary Cilia: Primers for Cell Cycle Progression Annu. Rev. Physiol. 71, 83 � 113.
various authors (2009) Hypoxia and Consequences From Molecule to Malady Ann. N.Y. Acad. Sci. 1177, 1 � 205. Negative feedback (speed, stability and biological effectiveness) universal features of all control systems: comparison of outcome with reference value, error signal, amplification, load, phase shifts, accuracy, speed and stability. Critical damping. Proportional control, integral control, derivative feedback. Why living cells have a multiplicity of control mechanisms (allosteric, covalent modification and genetic) rather then relying on only one technique. This material is kept in a separate website. We will cover some of it in the lectures if time allows, but in view of the mathematical content we will not set specific examination questions in this area. Feedback loops are fundamental to the operation of sensory transducers and this material could usefully be incorporated into examination answers. Apart from the excellent teams who work on neuromuscular coordination, who clearly do understand the problem, much of the analysis of feedback systems in biology is at a relatively trivial level. This supplementary section tries to redress the balance. There is no need to read every publication! The most relevant papers are highlighted and all have clickable links. The PubMed link will provide at least the abstract, and may give full text access to some papers, depending on publication date and publisher. Staff and students at the University of Leeds have full text access to all these publications via the second FULL TEXT link, both on- and off-campus. Leeds users will need to quote their library barcode, once per session.